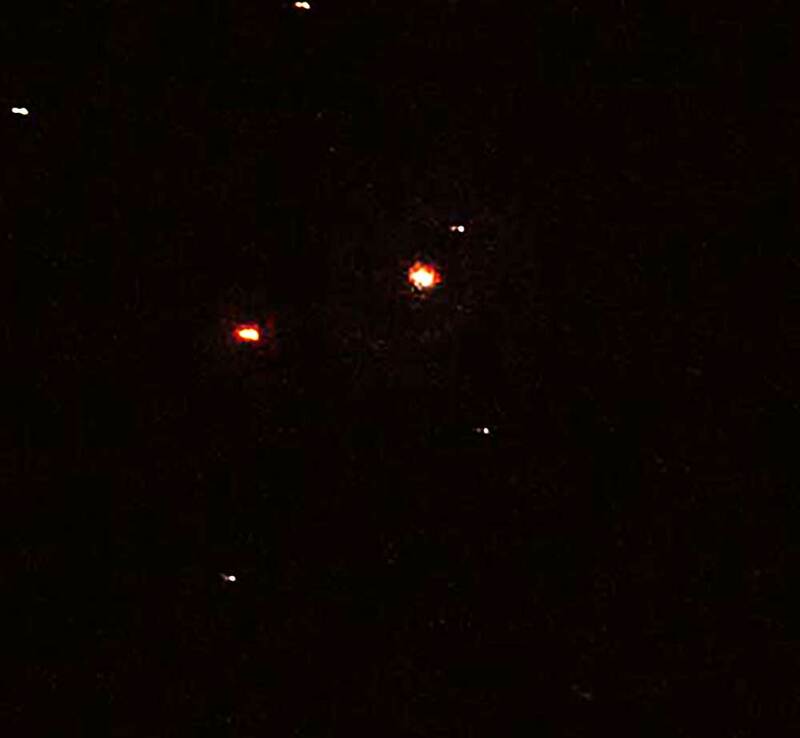 familiar faces, or should we say "voices", which is mostly all we can see or remember at night. Some of the folks that I saw included Mad About Mars, Eric; Left Scope Brought Binoculars, David; Big Scope, Roger, Civil, Civil Engineer and Astroimager, Marcello; Brings homemade cookies to Astrophysics, Steve; Took a break from having their kitchen remodeled to observe, John; Science Nerds and Theater Impresarios, Scott and Sandy, who were there setting up some of the OCA loaner scopes, which they coordinate; Used to Study Bugs, George (and Pat), left there scope at home; Sometime OCA What's Up Guy, Don McClelland; Many other folks and first time visitors, who really enjoyed being able to look through many of the scopes that were set up; and finally of course, New OCA Black Star volunteer and coordinator, Steve. Thank you Steve for helping make it all a great time! Before getting into the great observing we all had there, we should note our updated observatory calendar now has on its schedule a two week river cruise vacation Astronomer Assistants Ruby and Danny will be going to juvenile delinquent boot camp and Lavonne will be at the observatory, along with Astronomer Assistant Willow, while Resident Astronomer Peggy and I enjoy the sights, sounds, tastes and smells around the rivers and canals near Amsterdam and Belgium. Not sure if we will post anything while on vacation, unless something of astronomical significance shows up. 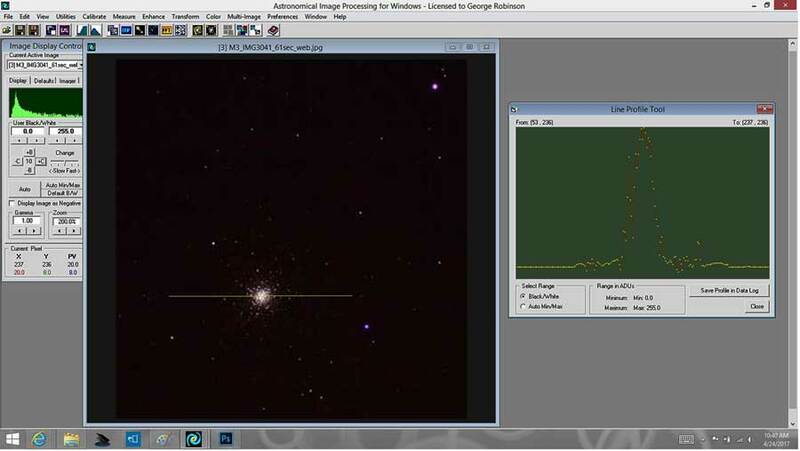 As the sun went down, I was able to get a pretty good initial polar alignment using Polaris. 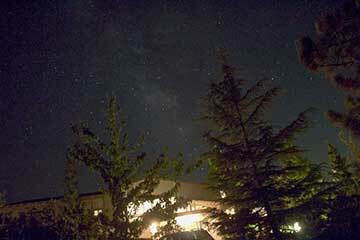 The dark skies made getting a further refinement in alignment by using two additional stars. One other lesson learned during this time was the necessity of erasing the earlier alignment made using Jupiter. I initially couldn't see Polaris in the camera Liveview and thought it might be due to the camera not being in focus, so I slewed and aligned the scope to Jupiter, which was very bright and I could make the focus adjustment and see four moons. 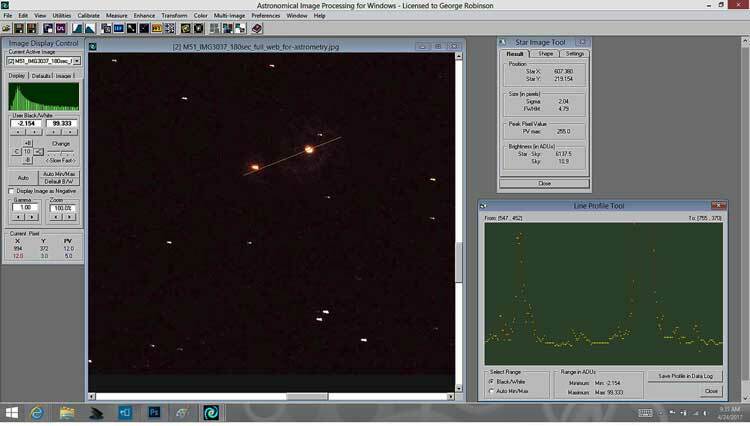 Then when I tried to do a more accurate 2-star alignment, something about not erasing the first Jupiter alignment caused some error so I just erased the presious alignment and tried the 2-star alignment again. With this better alignment, we should be able to see how well this new Ioptron mount performs the goto function and tracking for Earth's rotation. The first object selected for viewing was M51, The Whirpool Galaxy. The catalog list M51 as magnitude 9.0 and size = 11 arc minutes. I've tried looking at this before, but there are just too much city lighting to normally see it. This time I could see it quite well, even though as the following image shows, I still couldn't get very good resolution of the galaxy spiral arms. This might be due to my ongoing Photoshop learning curve and might also be due to the dark skies at Blackstar, which are pretty good but not as good as at OCA Anza site. 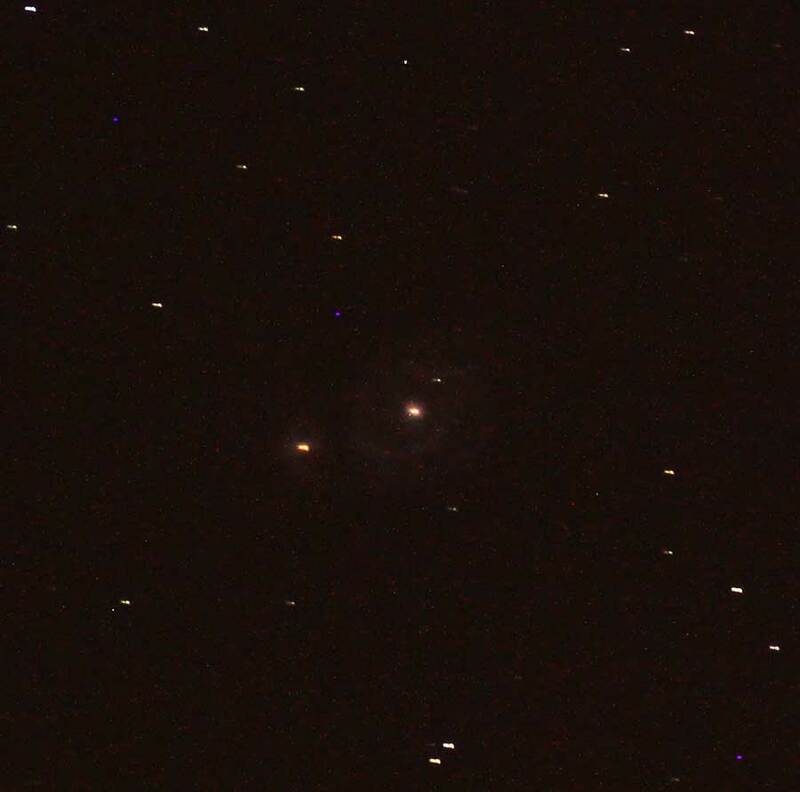 The next image of M51 is just the Jpeg camera file instead of the CR2 raw camera file. As described in the last post, I had been converting CR2 files to Photoshop PSD files with an older version of conversion software and was leaving more than 80% of the pixels out of the conversion. The original CR2 file is about 18 megapixels and the converted file was only about 3 megapixels, which is just about the same size as the camera generated jpeg file. Not good! Anyway, you can sort of make out the spiral arm structure of M51. 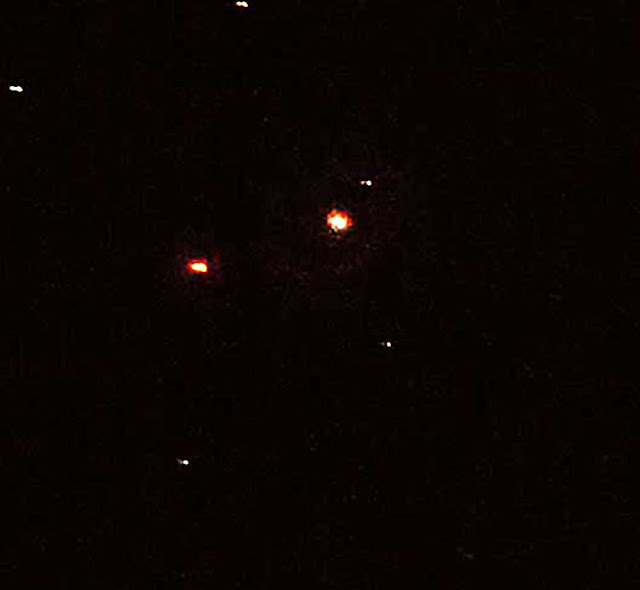 Now if I were a more dedicated astroimager I would have taken dozens of exposures and stacked them all together to get a better final image, and would have gone to a much darker site, but, hey, that is not e! I haven't decided to go done that path, yet! Next up on the observing list was M104, The Sombrero Galaxy, which the catalog lists at magnitude 9.0 and size = 8.7 arc minutes. 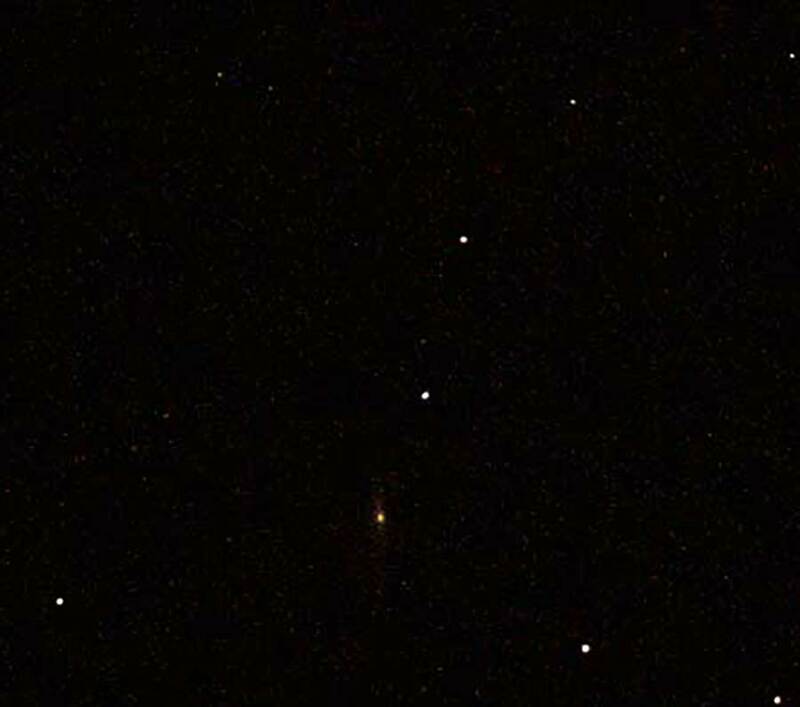 In the image, M104 is at the vertex of the inverted Y of stars. 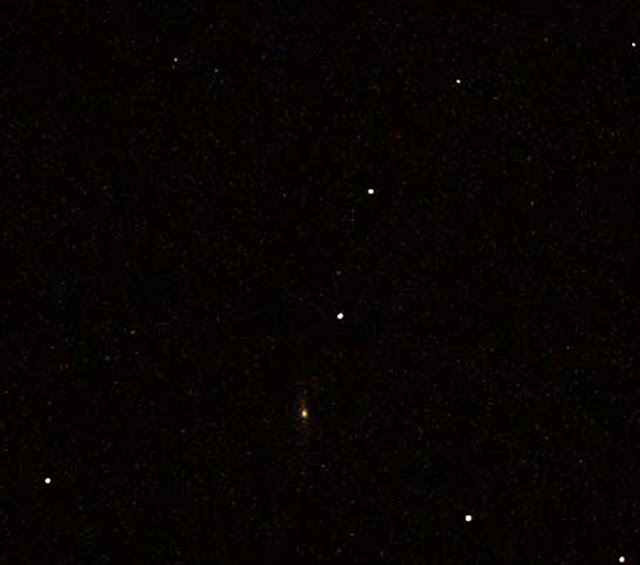 Other more dedicated astroimagers, like Mad about Mars, Eric, and Marcello, and of course the many much more dedicated astroimagers in the OCA Astroimaging SIG, have got great images of M104 by stacking multiple image taken in darker skies with longer focal length setups. Maybe I will eventually start doing that too! RA = 16 09 12.7 and Dec = +45 54 17. The comet has catalog magnitude of dim 7.6. So, I walked right back to my setup and entered those coordinates into the custom RA and Dec page. The mounted slewed to that sky position and I took this 180 second exposure. Hey, it looks like there is some fuzzy, comet looking object, right there in the center of the frame! Check out the image below. 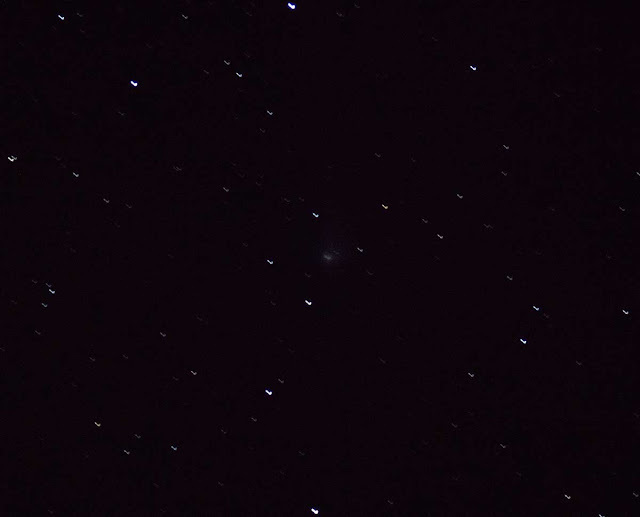 Ok, ok, it sort of looks like a comet or maybe a dim galaxy. Don thought it looked like a comet. But to sure, when I got back to the observatory, I uploaded the image to Astrometry.net to get the actual sky location where the camera and scope was pointing. Check out the screen shot below, which shows the camera center of frame at: RA = 16 08 42 and Dec = +45 57 15. 30 arc seconds in RA, which corresponds to about 8 arc minutes in angular error and the error in declination is approximately 3 arc minutes in angular error. I think that is close enough to say that the image definitely has captured comet Johnson C/2016 V2. In addition, since comets are moving through the solar system, there predicted RA and Dec change by quite a bit and some error in position will show up if the time of the prediction is not updated very often. Also graduating to a 3-star alignment, instead of just relying on a 2-star alignment, will reduce more of the pointing errors. 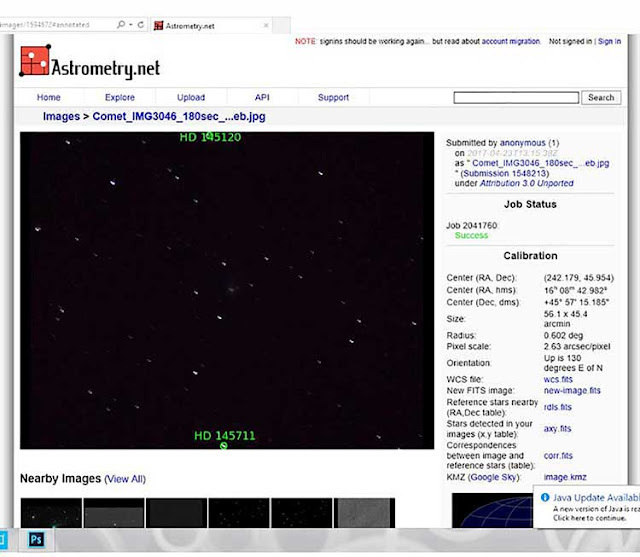 Also if some dim galaxy in the Messier or NGC catalog had been in the image, the Astrometry.net screenshot would have indicated it, and none are shown near the frame center. Yep, I think that fuzzy object is the comet! This success makes up for the failed attempt at capturing comet 41P as described in a previous post of April 3, 2017 and the better capturing on April 7. Yep, its all about continuing to learn and make progress and correct for our errors. Finally, these images of M51, M104 and M3 present an opportunity to do a little astrophysics homework regarding surface brightness. As is described, surface brightness is a measure of the apparent magnitude of extended objects, like galaxies and nebulas, that take into account the size of the object and report the objects magnitude per square arc second as it would appear if it were a star of that same relative magnitude. So, given catalog M51 magnitude 9.0 and size = 11 arc minutes, we can calculate surface brightness, assuming all the light is in a circle of 11 arc minutes in diameter as SB = 9.0 + 2.5 *log (11 * 11 * 3600 / 4) = 21.6 magnitudes per square arc second. 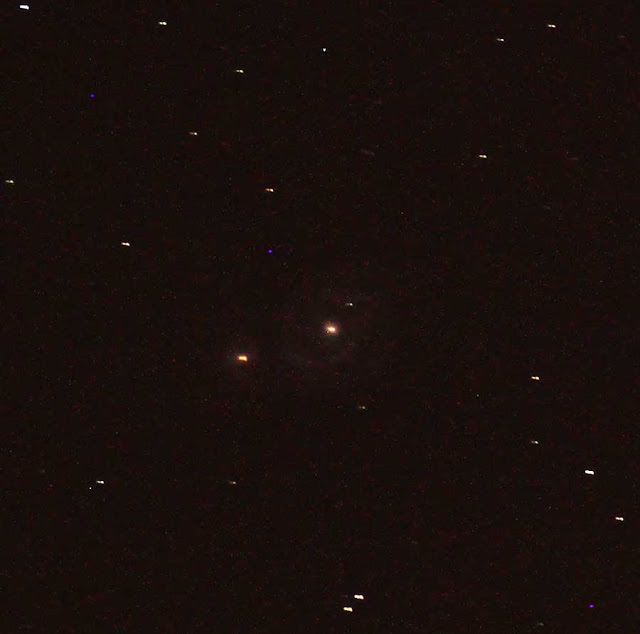 But we can see that these images of M51 don't appear to show the true size of M51. Professional astronomers have developed rules about how measure the size of extended objects and they will talk of luminosity functions that decline exponentially and integrate all the light up to a certain isophote limit. Well, its obvious that these images are not sufficient to do all of that type of analysis, but it was fun giving it a go. On the assumption that determining the size of some odd shaped object like M51 was maybe too difficult, I tried to measure the size of a more spherical object like M3, Globular Cluster. 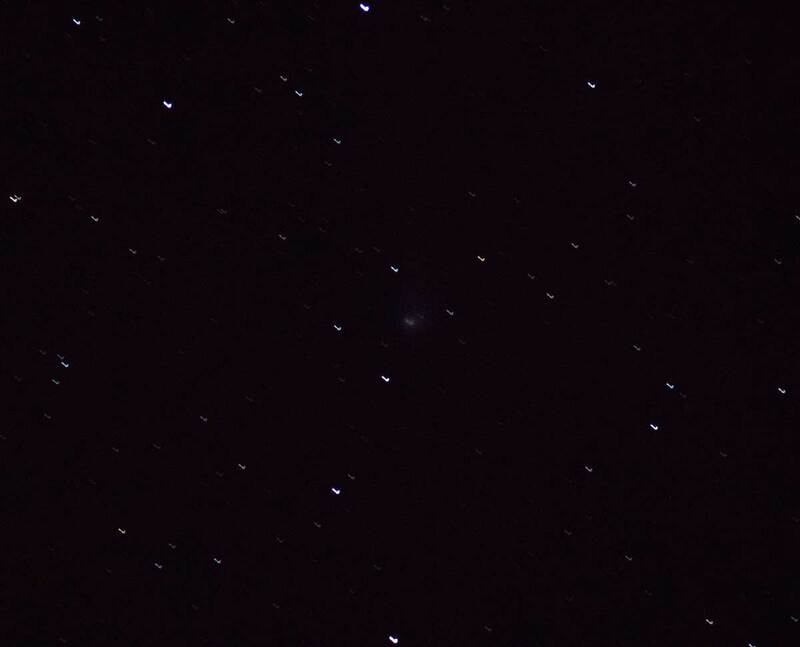 The image of M3 below was collected with 61 second exposure. The yellow profile line shows the catalog value for the size of M3, whereas I would have reported the size much smaller. So we find here too, even though the extended object is more spherical, the visible size of M3 is much different than the catalog value. Hmm, more work and study by this physicist wannabe to be done here.